The Tamerica ProCoil-53 Manual Coil Punch and Binding Machine is a heavy duty machine loaded with premium features. Create coil bound documents in almost any size, up to legal size. Fully disengageable punch pins, adjustable side margin, and a 4-position punch depth adjustment allow operators to get clean professional punch alignment every time. Punch up to 20 sheets at a time; coils are inserted by hand. Hollow ground dies provide clean punches, and heavy duty all metal construction ensures longevity. Tamerica offers a 1 year warranty on the Pro-Coil-53. This machine would be ideally placed in any office that has documents and presentations to bind, to present to clients or for internal usage. This Tamerica ProCoil-53 Manual Coil Punch and Binding Machine comes with Crimping Pliers. 4:1 Plastic Coil Manual Punch & Binding Machine. 13.5" open ended horizontal punch. Side margin and punching depth adjustments facilitate proper alignment. Max Punch Length: 13 1/2"
Dimensions (L x W x H): 21" x 16" x 11"
Many consumer grade binders don’t allow deactivation of individual punches to avoid making holes too close to a paper sheet’s end. This one does. If a tab is pushed in, that hole punches. If a tab is out, it doesn't punch -- from one to 53 holes. While you can turn the paper over to punch additional holes from the other end (since the right side of the machine is open), it's difficult and tedious to perfectly align new holes with the old ones. Typical consumer grade spiral core binders drill 46 holes, meant for paper up to 11-3/8" tall. This one punches up to 53 holes (1/8" in diameter), meant for paper up to at least 13.25" tall on one pass. Taller paper can be bound in one pass with more un-punched space beyond the last holes. The first thing I bound was an old music book on 9" x 12" paper. 48 holes were needed for that. We normally punch 42 holes with 11" paper, to leave more space beyond the last hole on each end – you can’t do that with a fixed 46-hole punch. This machine is mostly steel, plus heavy, and sturdy. Also, because of the loop handle design, it can be placed flush against a wall or in our case, a printer, to the immediate right. A machine with a handle that pokes out to the right may hit something adjacent to it. A loop handle also applies even pressure to the internal mechanism when punching, since it’s attached on both ends. Our machine is for home use and we won't be binding all that many things, so we didn't need an electric coil inserter. Manually screwing the coils in is slow, but that's OK for low volume work. You’d need to do a lot of binding to justify buying an electric inserter; e.g., this model with the electric inserter (ProCoil-53Ei) costs twice as much. The only negative is the adjustable paper stop – the stamped steel piece where the left side of the paper stack is aligned. It works but it should automatically square-up to the paper when you tighten the stop screw. It doesn’t. You have to carefully adjust it against the paper. The stop can also move when you tighten it. For small stop adjustments, whack it with something to slide it over. We are very pleased with this commercial grade machine! Nice binding machine! Review by Nick.B. The main reason for our purchase of this binder is the open throat end which allows us to bind documents over 12" in length. The machine works smoothly and is very good quality. No more sending out documents to the print shop for binding when we now can do the entire project in-house. Allows us to have a custom touch without the custom print-shop prices. Sales Operations Manager Review by Stacey K.
We love our new binding machine! It punches cleanly and easily. The support staff no longer dreads binding. Our presentations will look better and will increase our sales. 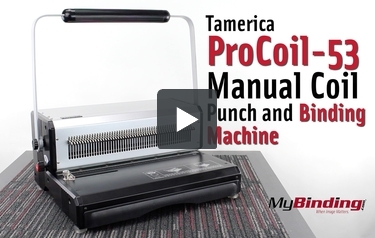 Transcript: This is the Tamerica ProCoil 53 Manual Coil Punch Machine! Before we actually make a book, we’ll first show the few features: there is a depth of margin control. This changes the distance of the holes from the edge, which you adjust for thinner and thicker books. It has an open side, which then allows you to punch sheets that are significantly longer. There is a helpful diagram on the front of the machine as well. And from time to time, make sure to empty out the waste tray. But of course we actually have to use the machine, so lets get to it! This is the Tamerica ProCoil 53 Manual Coil Punch Machine! First thing we are going to do is adjust the edge guide on the left. There are some markers beside it to help us distinguish where it goes. Next, punch a test page. Here we can now see if we need to disengage any of the punch pins—I have an incomplete punch, so I find the correct pin and pull it out. Now, after another test, fold the page in half to see if the holes line up, if they do, you are ready—if not adjust the edge guide more. We always like to start with our front and back covers—they are usually thicker, so punching two at a time is safe. This machine does punch up to twenty sheets as seen here, but you’ll notice that it is not easy. If you don’t want the hassle, remember that the fewer pages you punch, the easier it will be. So now that I have all my pages punched and in order, I’ll take the appropriately sized plastic coil and begin threading it into the holes. You can do this completely by hand, or to speed things up you can purchase a separate coil inserter. Now you’ll see the coil extends past both ends, we’ll then take a pair of coil cutting crimpers. Take the book, positioned as you see here, and cut off the end of the coil. Make sure that the dot of the crimpers is facing up. Flip the book over and do the other side. Once done, we have a finished coil bound project completed by the ProCoil 53 Manual Coil Punch Machine! Can this punch holes in hardback book covers? I want make spiral bound hard cover books. Thank you for your question, The Tamerica ProCoil-53 Manual Coil Punch and Binding Machine with Crimping Pliers would be able to punch most standard binding covers 1 or 2 at a time. We would recommend a more robust machine to punch book board from a traditional hardcover book. I want to do odd sizes to make photo books. Does this work with custom sizes? Thank you for your question. The Tamerica ProCoil-53 Manual Coil Punch and Binding Machine does have disnegagable dies to prevent getting extraneous hlaf punches on the edge of the sheet and would be able to work with custom sizes up to 13 1/2" wide. Can this machine do 11 x 17 - is there a way to flip page over and line up holes? Thank you for your question. The Tamerica ProCoil-53 Manual Coil Punch and Binding Machine does have a open throat so the 17 side would fit in but it does not have a continuous punching guide to keep the spacing even and would have to be done by eye and would be hit and miss. If you are going to be doing binding larger than letter sized you would be better served with a machine that has the continuous punching guide feature. What is the size of the punch hole? My current machine was purchased on Amazon. While I love it, I am wanting a slightly larger hole because my 14 gauge metal binding coils tend to not fit as well and make the page turning less smooth. Very interested. Thank you for your question. The Tamerica ProCoil-53 Manual Coil Punch and Binding Machine punches a standard 4:1 round hole which measures approx 1/8" in diameter. We also carry machines that punch a slightly larger oval hole that has the same 4:1 spacing. The Tamerica Optimus-46i punches oval holes and can be found here . Do you have a coil machine that punch differ shape holes? Thank you for your question. Coil binding machines are available in 2 different hole shapes. The Tamerica ProCoil-53 Manual Coil Punch and Binding Machine punches round holes. There are also machines that will punch a slightly larger oval hole. Thank you for your question. The Tamerica ProCoil-53 Manual Coil Punch and Binding Machine would work with books smaller that letter sized. The ProCoil-53 has disengagable dies to prevent a unsightly half punch on the edge of the paper. Does this machine punch a round hole? Thank you for your question. Yes, the Pro-Coil 53 punches with a round hole punch pattern. Is this binding machine or others on your site made in USA or imported? Thank you for your question. The Tamerica ProCoil-53 Manual Coil Punch and Binding Machine is manufactured in China. The country of origin is going to depend on the make and model of machine, some are made here in the USA. Will this work with all types of coils? Sure. Check out our coil section on the site and choose the color and size that you need. All of the standard 4:1 pitch spines will work with the Procoil53.